Lineage. Constituted as 352 Fighter Group on 29 Sep 1942. Activated on 1 Oct 1942. Inactivated on 10 Nov 1945. Redesignated: 113 Fighter Group, and allotted to District of Columbia ANG on 24 May 1946. Extended federal recognition on 2 Nov 1946. Established as 113 Fighter Wing, extended federal recognition and activated on 1 Nov 1950. Redesignated: 113 Fighter-Interceptor Wing on 20 Mar 1951; 113 Tactical Fighter Wing on 1 Nov 1958; 113 Fighter Wing on 15 Mar 1992; 113 Wing, 20 June 1992-. Components. Groups. 113 Fighter (later Fighter-Interceptor; Tactical Fighter), 1 Nov 1950-30 Jun 1974. 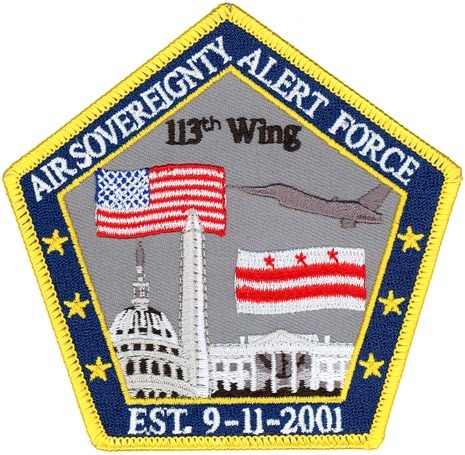 113 Operations, 15 Mar 1992-; 179 Maintenance Group, 15 Mar 1992-; 179 Mission Support Group, 15 Mar 1992-; 179 Medical Group, 15 Mar 1992-. Squadrons. 121 Fighter (later Fighter-Interceptor, Tactical Fighter, Fighter), 20 Oct 1946-; 201 Airlift, 20 Jun 1992-; 328 Fighter. 1 Oct 1942-10 Nov 1945; 486 Fighter , 1 Oct 1942-10 Nov 1945; 487 Fighter, 1 Oct 1942-10 Nov 1945. Aircraft. P-47, 1943-1944; P-51, 1944-1945. F-47, 1947-1949; F-84, 1949-1951; F-94, 1951-1952; F-51, 1952-1954; F-86, 1954-1955; F-86, 1955-1960; F-100, 1960-1971; F-105, 1971-1982; F-4, 1981-1990; F-16, 1989; C-38, 1998-; C-40, 2004-. Operations. Combat in ETO. Air defense of the District of Columbia, southern Maryland and northern Virginia. Called to active duty as part of the Korean War call-up, but remained stateside with a mission of air defense of Delaware Bay and the Delmarva Peninsula, 1 Feb 1951-1 Nov 1952. Called to active duty as part of the Pueblo Crisis call-up, 26 Jan 1968-18 Jun 1969. Provides short notice worldwide transportation for the Executive Branch, Congressional Members, Department of Defense officials and high-ranking U.S. and foreign dignitaries. Deployed in support of Operations: Southern Watch, 1996; Northern Watch, 1997, 1998; Noble Eagle, 2001-; Iraqi Freedom, 2003, 2007, 2010; EnduringFreedom, Oct 2011-Jany 2012. Decorations. French Croix de Guerre with Palm. First Air Force/Continental U.S. NORAD Region Meritorious Service Award, 2011.